Gloria Story Dittus hosted Story Partners’ Election 2014: Pollster Preview at her home Wednesday night, a conversation on the upcoming midterm elections. 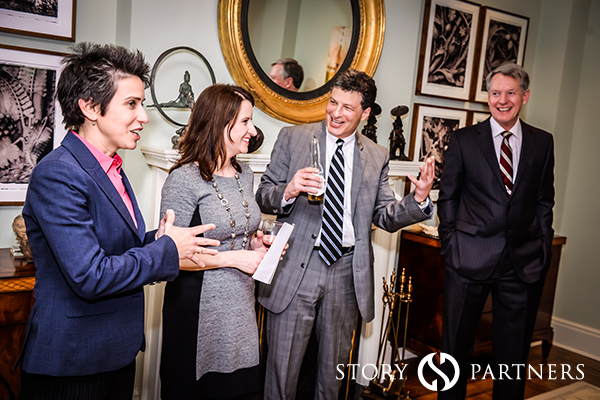 Roll Call editor-in-chief Christina Bellantoni moderated a discussion between Cook Political Report’s Amy Walter, North Star Opinion Research’s Whit Ayres; and The Mellman Group’s Michael Bloomfield. Walter, Ayers, and Bloomfield discussed specific Congressional races, offered their predictions, and answered questions posed by quests. In attendance: CBS News’ Nancy Cordes; POLITICO’s Lauren French; CNN’s Katie Hinman; WaPo’s Paul Kane; TIME’s Alex Rogers; Google’s Rob Saliterman; Amazon’s Steve Hartell; PhRMA’s Robert Zirkelbach; WellPoint’s Katie Zirkelbach; Exxon’s Jeanne Mitchell; Arch Coal’s Tom Altmeyer; Hogan Lovells’ Mike House; the U.S. Chamber’s Andrew Kovalcin; Southern Company’s Jeanne Wolak; NAPTP’s Mary Lyman; Missy Edwards of Missy Edwards Strategies; Cove Strategies’s Stephen Replogle; Tim Peckinpaugh of K&L Gates, API’s Eric Wohlschlegel; Greg Staley of U.S. Travel, SIFMA’s Lenwood Brooks and Carol Danko; and Story Partners’ Amos Snead, Andrew Fimka, Cameron Coursen, Gabrielle Beaumont, Lauren Culbertson, Patrick O’Connor, Grigsby Crawford and Olivia McDonald.